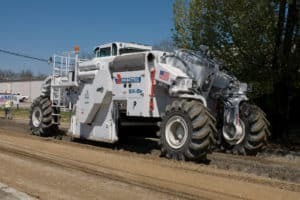 The Roadtec mid-size SX-6e/ex soil stabilizer-reclaimer features a clean-running 600 hp (447 kW) Cummins® QSX15 engine. It joins the larger 755 hp (563 kW) model in the company’s line of stabilizers-reclaimers. The SX-6e/ex complies with Tier 4 interim and Stage IIIb emission standards. Weighing in at approximately 65,000 lbs (29,480 kg), the SX-6e is balanced and powerful. Four cutting speeds and right-hand flush cut allow you to use the SX-6e/ex for a range of projects including stabilizing, pulverizing, or cold recycling. 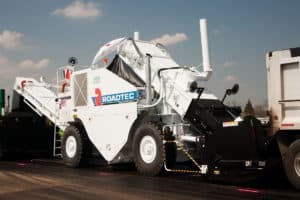 The Roadtec SX-8e/ex soil stabilizer-reclaimer features a clean-running 755 hp (563 kW) CAT® C18 engine. It is the largest, most powerful model in the company’s line of stabilizers-reclaimers. The SX-8e/ex complies with Tier 4 interim and Stage IIIb emission standards. Weighing in at approximately 75,000 lbs (34,090 kg), the SX-8e/ex is balanced and powerful. Four cutting speeds and right-hand flush cut allow you to use the SX-8e/ex for a range of projects including stabilizing, pulverizing, or cold recycling. The Roadtec mid-size SX-4e-ex soil stabilizer-reclaimer features a clean-running 450 hp (336 kW) Cummins® QSX15 engine. It joins the larger 600 hp (447 kW) model in the company’s line of stabilizers-reclaimers. The SX-4e-ex complies with Tier 4 interim and Stage IIIb emission standards. Weighing in at less than 55,000 lbs (24,950 kg), the SX-4e-ex is nimble yet powerful. Four cutting speeds and right-hand flush cut allow you to use the SX-4e-ex for a range of projects including stabilizing, pulverizing, or cold recycling. The SX-2e is a task-specific soil stabilizer with a rear mount cutter designed to perform small to medium sized projects with ease and reliability. The machine’s 380 hp (283 kW) is carefully distributed to conduct quality results in a number of project environments. The SX-2e cutter housing is positioned behind the tractor for excellent mobility. A high efficiency hydrostatic drum drive powers the cutter drum. 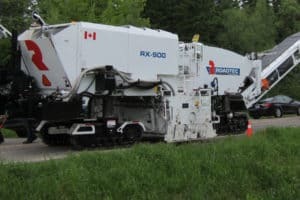 The RT-500 is a top of the line mobile recycle trailer that can either be fed and pulled by an RX-900 for Cold-In-Place Recycle or set up on a site as a Cold Mobile Mix Plant. With a rating of 500 tph it is capable of recycling miles of road in an extremely short amount of time. The advantage of the RT-500 is its closed loop sizing thanks to the onboard vibratory screen and horizontal shaft impact crusher. This also prevents you from having to pre-process your RAP when you use the RT-500 as a cold-mix plant. The RT-500 also has a weigh bridge on board to ensure extremely accurate additive injection in the pugmill. Both the RX-700e/ex and RX-900e/ex milling machines can be equipped with bolt-on packages that allow them to be used for Cold-In-Place Recycle (CIR). Since both machines are bi-directional, meaning that they can cut in forward or reverse, it's easy to switch to a down cut configuration. Simply work in reverse. Down cutting improves the control of material sizing and is advantageous in CIR applications. An additive spray bar is mounted on the cutter housing to inject emulsion or foamed asphalt into the cutter housing. 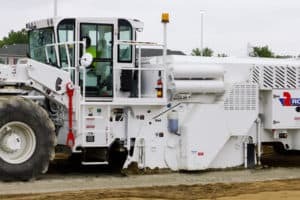 The additive is then thoroughly blended with the milled material by the cutter drum and can be left in a windrow or fed by the conveyor directly into a paver. The FB-100 was designed from top to bottom to be a resilient, high performance machine. It’s constructed the Roadtec way: solid, dependable, and durable. With axle capacities of 14,000 lbs (6,350 kg), this machine comes in at twice the strength of competitive models. The telescoping broom head, the front-mounted FB-100 model allows the operator to switch brooms quickly. Oil bath sealed brakes come standard on the machine to increase the wear life and decrease operating costs. With 950 hp (708kW) the RX-900e/ex is the most productive cold planer available. Power and heavy-duty construction make the RX-900e/ex the tool to own for high-productivity, half-lane or full-lane milling. This cold planer is available with either four-track or three-track assemblies. The machine cuts up to 14” (35.6 cm) deep and can be outfitted to work with different cutting widths. Standard widths are 7’2” (218cm), 8’2” (249cm), 12’ (366cm), 12’6” (381cm), and 13’ (396cm). Additional custom width can be supplied. 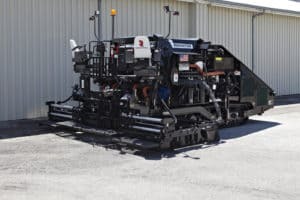 Like all Roadtec planers this model features 60° front load-out conveyor swing. 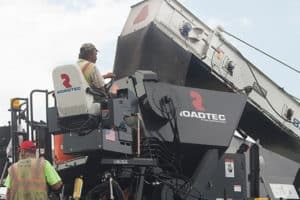 All Roadtec cold planers are designed for ease of maintenance and repair. 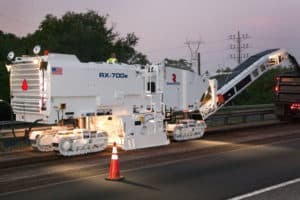 Featuring a 755 hp (563 kW) Caterpillar engine, the RX-700e/ex milling machine is available with either four-track or three-track assemblies. 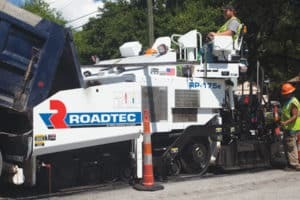 Built with the Roadtec focus on balanced weight distribution, the RX-700e/ex is a heavy duty machine that is user-friendly in both operation and maintenance. The machine cuts up to 14” (35.6 cm) deep. Standard widths are 6’7″ (201cm), 7’2″ (218 cm), 8’2″ (249cm), and 10′ (305cm). 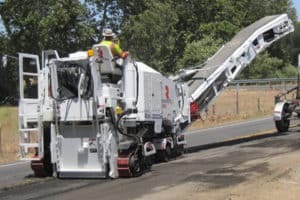 Like all Roadtec planers, this model features 60° front load-out conveyor swing. The optional VCSTM Variable Cutter System for cutting widths of 24”, 36” and 48” (60cm, 91cm, and 121cm) is also offered for this model. The RX-600e/ex is a 675 horsepower cold planer available with 4-track assemblies or optional 3-track assemblies. This lighter weight versatile machine allows contractor to cut up to 13” (330 m) deep with width of 6'3″ (1.9 m), 6'7″ (2 m), or 7'2″ (2.184 m). The RX-600e is light and maneuverable for urban situations. A two-stage front loadout conveyor, with 60° swing to either side, provides ample loading capacity. 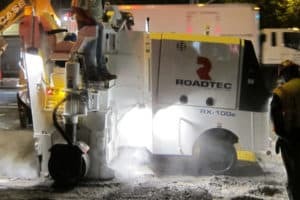 Roadtec’s RX-300 compact milling machine combines maneuverability with high performance to easily operate in a wide range of applications. With a base cutting width of 48” (1.2 m) and the capability of cutting up to 12.5” (220 mm) deep, the RX-300 is excellent for both commercial applications and narrow milling projects. 100° load-out conveyor swing capability allows the machine to easily discharge material in a wider range of environments. The RX-100e is a highly efficient utility milling machine for use in smaller areas. The machine's tight turn radius allows it to easily cut around manhole covers and other obstructions in the roadway. This versatile machine cuts up to 8 inches deep and 20 inches wide. 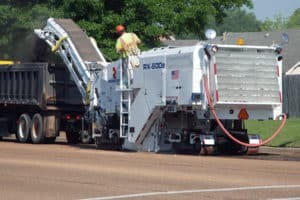 The SB-2500e/ex Shuttle Buggy® material transfer vehicle (MTV) can store and transfer hot-mixed asphalt material from a truck to a paver for continuous paving. A patented anti-segregation auger remixes materials just before they are delivered to the asphalt paver. The 25-ton surge capacity of the Shuttle Buggy® MTV allows trucks to unload material immediately and return to the asphalt plant. Optional windrow pickup head is available. The SB-2500e/ex is powered by a 300 hp Cummins® QSL 9 Engine. The Roadtec Shuttle Buggy® material transfer vehicle SB-1500 features a low weight and narrower wheel base. It can store up to 15 tons (13.6 mt) of asphalt mix, allowing haul vehicles to unload as soon as they arrive. This substantially reduces trucking costs. The SB-1500 features an end dump hopper or an optional windrow pickup head. It also features the patented anti-segregation auger which remixes materials for control of aggregate and temperature segregation. 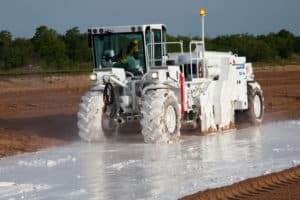 The MTV-1000 material transfer vehicle, like the Shuttle Buggy® models, is capable of transferring while reblending paving material to allow for continuous in-line paving. 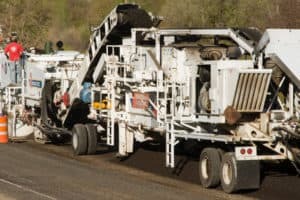 The patented, offset gravity transfer provides reblending of asphalt materials just before they are delivered to the paver, eliminating truck-end segregation. With an optional windrow attachment, the MTV-1000D can pick up material from a windrow and transfer it to the paver. The EZ Series from Carlson features electrically heated vibratory screed plates and extensions. The patented, tapered shape of the Carlson main screed plate assures that material is moved toward the outside for a uniform mat no matter whether extensions are in or out. Carlson EZ screeds also feature a food warming oven to heat crew meals. 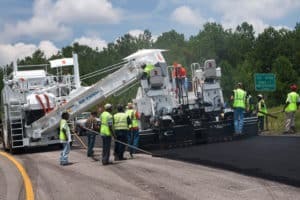 With hydraulic, vibratory extensions supported on heavy-duty, high-strength slide tracks this series offers paving widths from 8 to 19 feet (2.4 – 5.8 m). EZIV extensions have pre-strikeoffs. Optional hydraulic berm builders are offered. The EZ Series from Carlson features electrically heated vibratory screed plates and extensions. The patented, tapered shape of the Carlson main screed plate assures that material is moved toward the outside for a uniform mat no matter whether extensions are in or out. Carlson EZ screeds also feature a food warming oven to heat crew meals. Carlson EZIII screed extensions move on adjustable brass slide tracks. 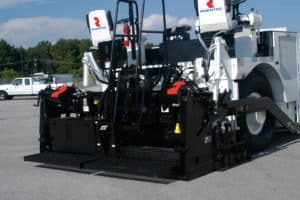 The paving width of the EZIII-8 is 13’-6” feet (4.1 m), and the paving width of the EZIII-10 III is 17 feet (5.2 m). 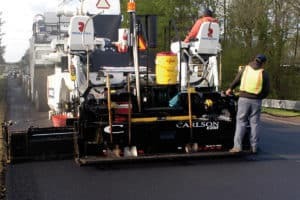 These quick-reacting screeds are ideal for commercial paving. Roadtec’s fixed width bolt-on extendable screeds with hydraulic strikeoffs come in an 8 foot (2.4 m) version or 10 foot (4.1 m) version. Strikeoffs can be articulated from 6.6% positive to 3.3% negative. Bolt on screed extensions fit both the S-8 and the S-10 models. These tough, reliable screeds will serve you well for a wide range of projects. 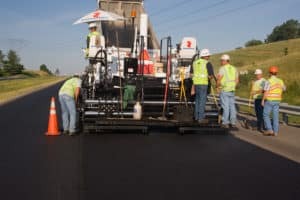 The SP-200 Spray Paver sprays tack and applies hot mix asphalt seconds later. Combining spraying and laydown produces a high-quality mat with a strong bond between layers. A spray bar just in front of the paver’s auger distributes the liquid through computer-controlled, self-cleaning valves. An onboard microprocessor precisely controls the rate of flow. Valves can also be controlled manually. Valves are arranged in sets of three, providing plenty of spray capacity so you can move fast. To cut down on refill stops, the SP-200 is equipped with a 2,100 gallon tack tank, the largest tank available on the market today. 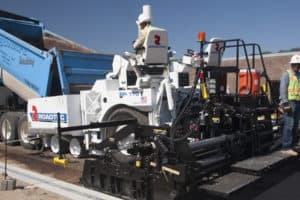 The SP-100 Stealth™ paver is a simply designed, low-maintenance gravity-fed paver specifically for operating with the Roadtec Shuttle Buggy® material transfer vehicle. Gravity feeds the material directly to the auger from the mass flow hopper, replacing the need for slat conveyors, hopper wings, push rollers and tandem front bogies, thereby significantly reducing maintenance costs and initial purchase price. 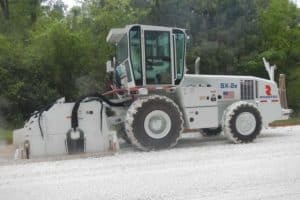 The RP-195e/ex is a powerful, rubber-track paver made for highway work. Seats of the dual operator stations can move out beyond the sides of the machine to give the operator an excellent view down the sides of the machine. The four-way hydraulically adjustable operator seats feature a ride control tension system for ultimate comfort. Noise levels of Roadtec pavers are among the lowest in the industry thanks to variable speed fans. 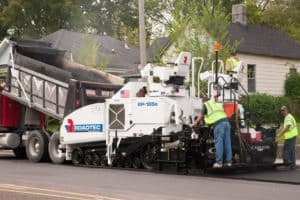 Roadtec pavers come equipped with standard fume extraction systems for the operator area. 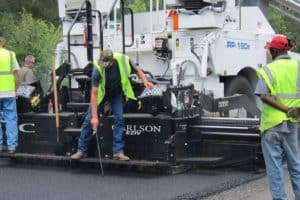 The RP-190e is a powerful, rubber-tired paver made for highway work. 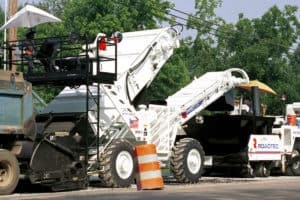 Seats of the dual operator stations can move hydraulically out beyond the sides of the machine to give the operator an excellent view down the sides of the machine. The four-way adjustable operator seats feature a ride control tension system for ultimate comfort. Noise levels of the Tier 4 Roadtec pavers are among the lowest in the industry thanks to variable speed fans. 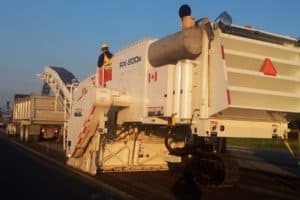 Roadtec pavers come equipped with standard fume extraction systems for the operator area. 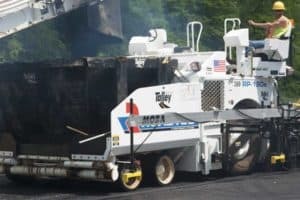 The RP-175e is a powerful, compact 8' (2.5m) wide rubber-track asphalt paver designed to work in all types of sub-grades and paving applications. Full counter-rotate ability and track flotation allow the RP-175 to maneuver and pave in tight areas without sacrificing tractive effort or pushing power. Seats of the dual operator stations can move out beyond the sides of the machine to give the operator an excellent view down the sides of the machine. 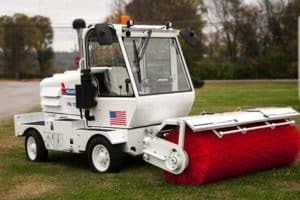 The RP-170 is an 8’ (2.5 m) wide rubber-tire asphalt paver with a compact wheelbase for greater maneuverability without sacrificed performance. The RP-170 can achieve a 30 inch turning radius, with the only industry standard steering assist engaged, which is helpful for managing those tight spots around barriers and drains. Seats of the dual operator stations can move out beyond the sides of the machine to give the operator an excellent view down the sides of the machine.